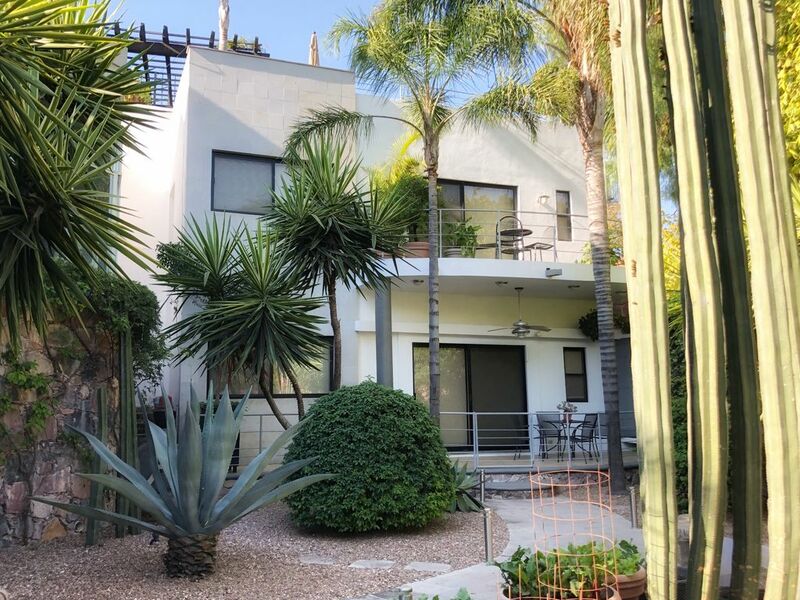 This modern two-story casita with a third floor rooftop terrace (approximately 900 square feet) is housed in a separate building and walled area inside our compound in one of the most desirable and most secure areas of San Miguel de Allende, recently rated the 'Best City in Mexico' by the readers of Conde Nast. Surrounded by beautiful rock walls and lavish landscaping this casita has a private desert garden. Located in the Centro just a 12-15 minute easy walk to the Jardin and close to pastoral Juarez park, this property is always in demand. This unit is like no other in San Miguel, built in 2006, modern, spacious, with hard to find amenities. It contains the best of everything -- stainless appliances, Bosch stove and oven, on-demand hot water heating, granite counters, high end audio system with Auky bluetooth device that allows you to play any music on your smart device or stream from any music source to which you have a subscription, cable television, high speed wireless Internet, CD changer and speakers. This Casita is appointed with ceramic tile, granite, and maple furniture. The bedroom includes a separate sitting area, desk, gas fireplace heater (with oxygen depletion sensor), carbon monoxide detector and one bathroom with travertine, ceramic tile and granite counters on the first floor, a large kitchen and living area on the 2nd floor furnished with leather and art by some of the best artists in San Miguel. A circular staircase elevates you to a 3rd floor terrace with beautiful views, patio furniture, umbrella, gas grill and outdoor speakers. There are NO difficult-to-handle 5 gallon bottles needed here -- water on this property goes through a 6-stage purification system, is pressurized and softened. Maid service once per week is included. High-speed secure wireless Internet (up to 100 mb). A 37" flat panel television with cable TV sits atop the gas fireplace in the bedroom and sitting area. The full bathroom is shower only with opaque skylight. The property also has a programmable digital safe for jewelry and personal valuables. Need two bedrooms? A smaller, one-floor, one bedroom casita is available inside the compound if you need another bedroom for an additional fee. Rent them both -- great for two couples who want to be together but enjoy their privacy. It has a separate full kitchen, living room and a fabulous rooftop terrace and most of the same amenities. Photos and pricing of the second unit are available upon request. **Inquire about how to receive a discount of up to 10% discount. We purchased this property as part of a larger piece in 2001. In 2007, the casita was bult and the main home in the compound was begun. We have lived in SMA full time for 16 years and know the town, it's people and amenities well. Easy 12-14 minutes to the center of town via sidewalks and cobblestone streets. Maid service is provided twice per week. More frequent service available for additional charge. Washing machine on premises available to long term (2+weeks) renters on Sundays. Paid laundry service (per kilo) available approximately 4 blocks away. Dryer on premises available to long term (2+weeks) renters on Sundays. Paid laundry service (per kilo) available approximately 4 blocks away. Street parking or paid parking available a few blocks away. Towels plus two bath robes provided. With ice-maker using 6 stage filtered and softened water. Small appliances including toaster, food processor, and all necessary dishes, serving pieces, etc. to set up housekeeping. Seating for 3 at inside bar or outside second terrace dining for 4 or 3rd level outdoor terrace dining for 4. 32 inch flat screen monitor with cable television, English and Spanish. Yamaha audio system with Auky bluetooth device that allows you to stream your music from your smart device or any music source to which you have a subscription. Or, bring your own music CDs. 3 levels with top a large patio overlooking city - BBQ grill, umbrella, table, chairs, lounge chairs, etc. Granite counters, high-end stainless appliances, three ceiling fans, three terraces at different levels, view of the mountains and City from rooftop, gated desert garden, ceiling fans, in a gated family compound. We spent over a month and found the location central to the areas we frequented without having to mountain climb as you would with some rentals. The area was quiet during the evenings ( except for holidays then the fireworks go off everywhere ).The casita is well outfitted, comfortable and has a complete kitchen as well as a bbq. It was cleaned weekly for our month stay and the house keeper did an outstanding job. The owners were also very friendly and helpful, assisting us with a few extra requests. If we were to return I would definitely like to stay here again. Comfortable, quiet and easy access! We recently spent a month in Kelly and Jim's Casita Grande. It was a wonderful stay, and we've already made arrangements to return again next year! The casita is well-equipped and comfortable, the staff is friendly and helpful, and Jim and Kelly are thoughtful, considerate hosts. The location of the casita in the back of the property makes for a very quiet stay (considering the typical variety of noises you find around San Miguel de Allende in most other locations). It is also easy to get to the Instituto Allende, as well as the centro area around El Jardin from the property. We cooked fairly often, and found the kitchen nicely stocked for our use. Highly recommended rental! Russ and June, thank you for staying with us and your nice review. We look forward to hosting you, again, next year! My husband and I stayed at Jim and Kelly’s beautiful Casita for the month of June. Everything was perfect including the hosts, the location, comfort and beauty of the Casita and its surroundings. It has everything you need for an enjoyable vacation. The compound is located close enough to walk almost everywhere in SMA and yet far enough to have a quiet and relaxing stay. The Casita is fully equipped with everything to make you feel at home. We especially loved the purified water (no need for bottled water! ), kitchen, private roof top with breathtaking views, dining area and gas grill, the landscaping, privacy and weekly cleaning to make your vacation a truly pampered one! Jim and Kelly were great and made us feel more like friends than tenants! We will be back! K and D, thank you. We truly enjoyed meeting you both and look forward to hosting you again. Our stay at Kelly and Jim's Casita was wonderful. We were in the large Casita, which is a modern & bright place. The interior is lovely & we enjoyed the 3 outdoor spaces- the patio, the second floor terrace, & the rooftop terrace at different times of day. The kitchen is easy to work in & well equipped with a good assortment of spices, teas, & coffee. The filtered water throughout the house was a luxury- we filled our water bottles each morning from the tap & took them with us for the day! We often ate breakfast outside & marveled at the hummingbirds, butterflies, and cactus garden. The whole place feels very secure and is also surprisingly quiet, given the noises of the neighborhood. We had wondered whether it would be hot, but it was mostly cool inside & we rarely used the fans. The beautiful Casita is one thing, but the people make it a special place to stay. Kelly was always helpful, whether at home or away. She answered emails very quickly, although we didn't have much to ask, since things were mostly great. Jim was also friendly & helpful when we saw him. Artruro, who is a a gentle & considerate person, was on the property most days. He would fix anything at a moment's notice- not that there was much to fix! Betty, who cleans once a week, is also very nice & very thorough, always leaving the place spotless. Kelly invited us over for a delicious dinner, where we had the opportunity to meet our neighbors in the smaller Casita. It was a lovely evening and we finally met all of the dogs! The Casita is so nice that we could have just stayed there for our whole visit to San Miguel. However, we were out every day, sometimes for 8 to 10 hours, mostly walking, sketching, eating, and attending a variety of events- including the pageantry of Semana Santa. On the first day, and every day after, we would step outside the gates & drink in the gorgeous views in all directions- the cobblestone roads, the luscious flowers, and the colourful architecture. We mostly tended to walk straight to the center of San Miguel, on a reasonably level route by San Miguel standards! It was a pleasant 15 minute or so walk, depending on how many times we stopped to take photos. Sometimes we would head in a different direction to the main street along picturesque side streets. There is much more to say, but one lasting memory was the fallen flower petals on the driveway many mornings. That was challenging to photograph- you have to see it yourself! What a great place to stay. This lush, private compound gave us the feel of being somewhere in the country but was an easy, safe, 12 minute (as stated) walk to the center of town. The casita is inside the compound and set back from the street so was very quiet. We enjoyed listening to the birds each morning while we drank our coffee on the upper terrace. The casita was well-appointed and relaxing to be in. We were very comfortable and our hosts went out of their way to make us feel welcomed and informed. We will be back! Near Parque Juarez in most desirable and safest area of San Miguel de Allende. Rentals rates of more than one month at some times of year are negotiable. Contact owner.